During the long cold spells on Planet Guinea we have been putting our new Indoor/Outdoor and Maximum/Minimum thermometer to good use. Previously we have had the essential Max/Min one but the new gadget is far more interesting. Whilst we never rehome unless at least a shed can be provided for the damp and winter months I was shocked to see how cold an unheated shed really is! The store shed only has the bare bones up (ie floor and walls), but is a large and extremely sheltered space with no snow blowing in it and probably more sheltered than your average ‘sheltered spot’ on the patio etc. However, last night the temperature fell to -4C while the heated shed fell to 8C ( preferred temp 10C). Purely for my own interest I’ll be recording the high/low temps when the windows go back in too! I don’t intend to heat that space and can see it making great fodder for comparing temperatures! Read about the Gorgeous experience of Snow Days on their blog: Stocking Up Food For (guinea pig) Emergencies. These were the words on the framed certificate received by my wonderful home visitor this weekend, along with an RSPCA pin brooch. Chrissie joined ‘the team’ in 2002 as a home visitor and was also responsible for the original website. All that aside Chrissie has adopted more guineas from me than anyone else. Chrissie adopts the older guineas, Mr Happy being the oldest- adopted at 5 years old. Over the seven years Chrissie has adopted well over 10 guinea pigs from me including 3 pairs of boars, the famous Florence who left us aged 9 after spending 6 years as a Gorgeous Guinea and Marvellous Marbles (also one of the pairs of boars), whose bladder issues are well documented and often used as an example for helping other guineas in similar situations. Chrissie has also been there for the real emergencies when I’ve been full, one of whom was the Gorgeous Eclipse who was about to be put to sleep because of his ‘skin condition’ (but that’s another story!). Eclipse, who spent his first wheeks with Chrissie who also treated his skin condition along with Jenny at Active Vetcare. 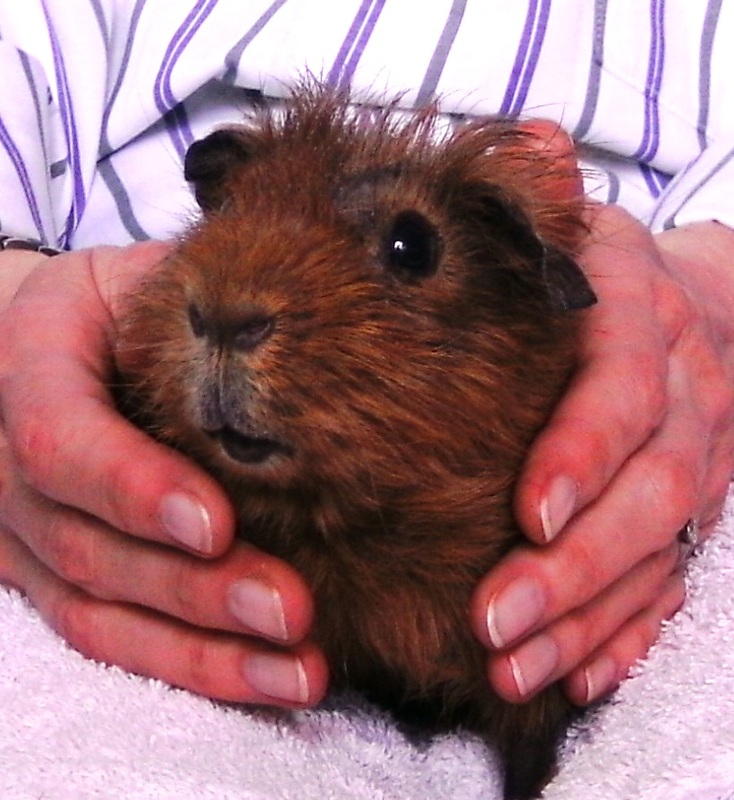 The responsibility of what medical treatment your guinea pig receives is in your hands, ultimately; it is you that decides on who will treat your guineas and this is likely to affect the eventual outcome. However, one would hope that your vet can guide you in this treatment with the benefit of their knowledge and, if you are fortunate, their good experience. Information is much more accessible now, both to the veterinary proffession and to the general public. This, however, does not prevent mistakes. In the last 2 weeks RGPR have been aware of 2 vets prescribing Penicillin to guinea pigs- something they CANNOT tolerate! The problem is that the drug is not ‘called’ Penicillin which, unintentionally, disguises the active ingredient to those who might know that it should not be given. Generally speaking anything ending in ‘cillin’ or ‘mycin’ must be investigated further for the active ingredient. Unless all other options have been tried and the situation is a do or die one giving Penicillin is not wise! See NOAH for more information, but feedback should be to your vet. Getting compliments for the amount of help and useful information we give out when we rehome guinea pigs is always flattering, but when someone tells you that they only want RGPR to rehome their guineas and they’re happy to wait until there’s room in the rescue for them, it has to be the ultimate of all compliments. There are many people who care desperately what happens to their guineas when they go into rescue and on many occasion I’ve been told that RGPR were ‘chosen’ because we are a guinea pig specific rescue. Whilst I could bluff my way through a few other animals I don’t believe that’s good enough for them and stick to what I know. Recently I was referred to as having ‘strict rehoming policies’ by a couple wishing to find somewhere that would take their beloved guinea pigs. They viewed this as a positive feature of rescue, also the fact that we only rescued and rehomed guinea pigs. Clover arrived at RGPR in late 2002 looking nothing like she does in the pigture! She was one of the first ever guinea pigs to trial Gorgeous Guineas shampoos, when veterinary treatments had failed. That was the pig that was Mrs. Fox….